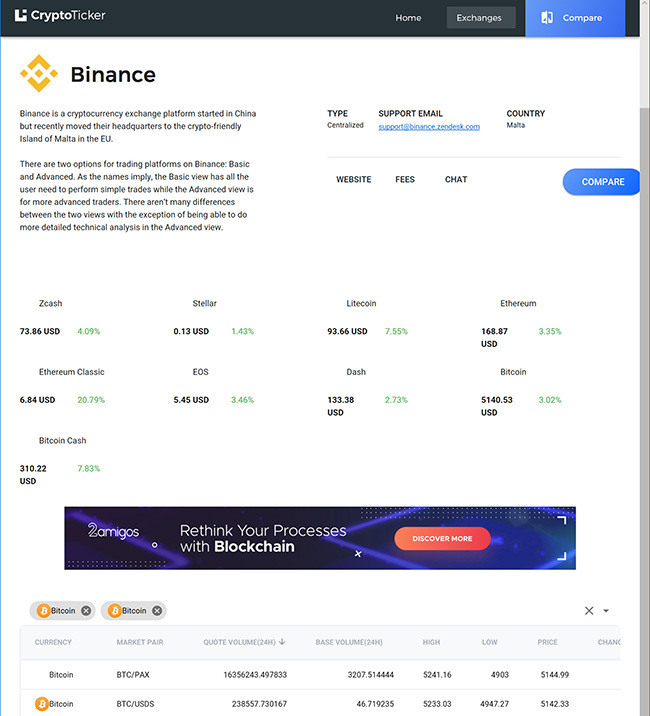 We just released CryptoTicker.cc, a free tool that provides anyone interested in cryptocurrency an easy means of discovering available exchanges and comparing those exchanges as well as comparing currency markets in those exchanges. For anyone interested in Bitcoin or other cryptocurrencies, it’s a very robust and useful tool that can make the process of getting started a lot easier. There are a lot of different exchange websites out there that have different fees, offer different markets, might be centralized or decentralized, and such. CryptoTicker.cc gives you a lot of information up front about different exchanges that enable you to research currency exchanges more easily. Looking at CryptoTicker.cc, you can see that there are several popular exchanges listed (with more to come in the future). You can view a very large amount of information about each exchange. For example, get information about their top (highest volume or best moving) markets and prices, if they’re a centralized or decentralized exchange, their support email, what country they’re based in, an exhaustive list of what markets they offer with a market pair, their quote volume and base volume, the high and low for the coin, the price, and the 24 hour trend chart/graph when you click the market pair row. Finally, there are links to the exchanges’ websites, fees, and a “chat” or “blog” option (bringing you to a channel to communicate with them or some kind of support). Why exactly did we want to release this tool and release it as free tool for the general public to use? We have been working a lot with cryptocurrency applications and we felt like this ticker would be a good way for our development team to learn, experiment, and sharpen their skills. We made it an official project with proper reporting to a manager, and work reviews to ensure that CryptoTicker.cc development was a valuable, real-world experience for our developers. The project went so well that we realized we had an awesome, complete tool on our hands that could prove very useful for the general public. As a company, we enjoy providing tools, libraries, and widgets that other people can find value in. Consequently, we released CryptoTicker.cc to the public. Now, anyone and everyone can easily discover, compare, and then choose the exchange that best matches their needs.